Ryo Central: Yes, cold brewed coffee is drinkable ⛾. Yes, cold brewed coffee is drinkable ⛾. Yeah you know I'm away from drinking filter coffee. I prefer my capsule of Nespresso. But this time I tried something: Cold brewed coffee. What is this? Coffee poured with room temperature water and leave it for 12-24 hours. I used Lavazza Espresso coffee, which is one of the finest you can get in most regions. 1/8 coffee. That means 1 cup of coffee powder to 8 cups of water. Like I always do, I used filtered water, to get a soft water but that's totally not necessary. You can also use normal bottled water or even tap water. I chose to let it soak for 14 hours over night. Totally convenient. Just prepare it at the evening and in the morning you have your coffee waiting for you. 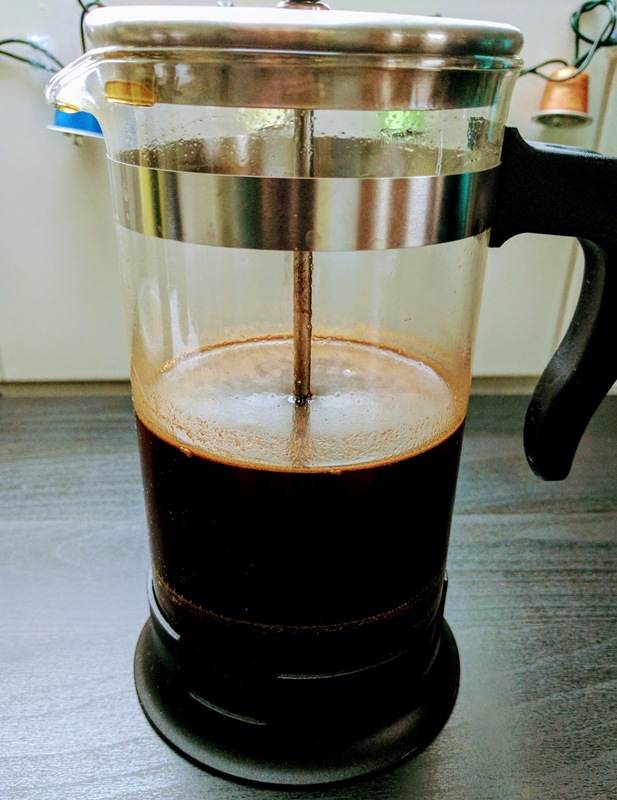 A french press (see photo) is very convenient to separate the powder from the water later on. I found that it isn't that much of a different if you try it one hour less or more. So you're kind of flexible on that. So the taste is like you can read in many places of the internet. Strong taste with not so much caffeine than normal coffee. But be clear on that, because we need much more coffee powder to brew it, it will have just enough caffeine 😁. You'll discover that it tastes much more intensive than normally brewed coffee, but not bitter, because there are less acid pulled from the powder. That's a great feeling. Furthermore it is said that it is better suitable for your stomach, but I can't prove that. My stomach is coffee compatible anyway. But it's worth a try if you're sensible to it, but still want a strong tasting beverage. So yeah, if you want to try something new, you can do it. It's easy to make, and for all the preppers and environment friendly people: You need 0 energy to brew that kind of coffee. Tip: If you later decide you would like to have a hot coffee instead of drinking it cold, no problem. Just heat it to your likes after you pour the coffee. Do not boil, just so much heat that you can drink it. And do not heat it with the powder still in the water.